Amateur Photographer (AP) magazine has this afternoon named its products of the year at a glittering awards ceremony in London hosted by AP Editor Damien Demolder. 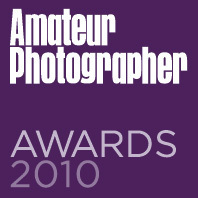 The 2010 Amateur Photographer Product of the Year was awarded to the Canon EOS 7D digital SLR in a contest that honours the best photographic equipment reviewed by AP during 2009. 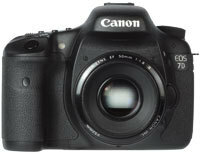 The Canon EOS 7D also scooped the best Enthusiast Camera title, a category sponsored by Photobox. Commenting on the EOS 7D?s triumph, judges said: ?Competition between manufacturers is always good news for photographers and the EOS 7D signals the beginning of Canon?s fightback against Nikon. ?Although it has an APS-C-sized sensor, this camera has an excitingly high pixel count of 18 million, which Canon has managed to combine with a maximum sensitivity setting equivalent to ISO 12,800 without producing images with excessive levels of noise. ?In addition, there?s built-in wireless flash control, a versatile 19-point AF system, HD video recording capability (1920×1080 pixels at 30fps, 25fps or 24fps, or 1280×720 pixels and 640×480 pixels at 60fps or 50fps), and a new 3in, 920,000-dot LCD screen that is less troubled by reflections than some of its competitors because of its novel, optical-plastic-filled construction.? The judging panel, which is made up of the magazine?s technical team, added: ?Landscape lovers will also appreciate the built-in electronic level that can be displayed on the LCD screen or in the 100% field of view viewfinder, so horizons need never slope again. ?Besides the extensive feature set and excellent handling, the Canon EOS 7D is a superb choice for enthusiasts because it is capable of recording a very high level of detail, even rivalling some full-frame models.? Proving just how much of a stir this camera has created, the Canon EOS 7D was also voted the Amateur Photographer website Forum Product of the Year by members of the AP forum (www.amateurphotographer.co.uk/forum). The announcement was made by forum moderator Fen Oswin. The Amateur Photographer Awards were held at One Whitehall Place, London ? an annual event regarded as one of the highlights of the photographic industry calendar. Guests included Daily Telegraph journalist Alex Singleton, who is a keen photographer. Full details of all this year?s winners, runners-up and nominated products will appear in AP?s special Awards issue, dated 20 February.